SCOOP: Bobby V's karaoke is casual, fun, and people stay out of your face. MY TAKE: Last night’s research was a bit too fun; I didn’t mean to stay out until 12:30am. Shout out to the wonderful bartenders who made our night even more enjoyable with their laid-back personalities. What a nice change from snooty bartenders who act like you’re bothering them by asking for a beer. Even when the bar was busiest, the bartenders were pleasant when they got to us. 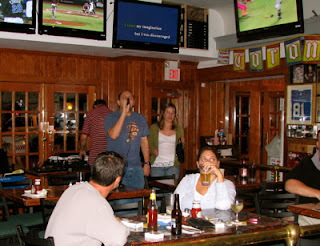 That pretty much captures the vibe at Bobby V’s- no pretension, just people out to drink with friends, have a late dinner at the bar, and take in the karaoke scene. Guys after work, guys after softball, girls with their guys, people there to sing. Everyone did what they wanted and kept out of each other’s way. The bar is in the center of the room, dividing the room in half, so there’s no crowding. It’s a great set up. The karaoke went smoothly; the MC knows what he's doing. Most singers were decent. A few stood out, including the guy who sang “Sweet Child O’ Mine” and Verne, who sang the blues. Props, brothers, hope to hear you again. VERDICT: I’ll be there next week. Let's all do what we can to keep the place hopping, especially in the dark days of winter. If you liked karaoke at Bobby V's, you should give Route 22 a try on Wednesday night. The bartenders ar egreat, atmosphere feels comfortable, and the sound system this guy (Easy E) has is really good. Singers are great too, but anyone who sings gets a great response. I go there as often as I can.